One way to measure the size of the planets is by radius. Radius is the measurement from the center of an object to the edge of it. Mercury is the smallest planet with a radius of only 2,440 km at its equator. 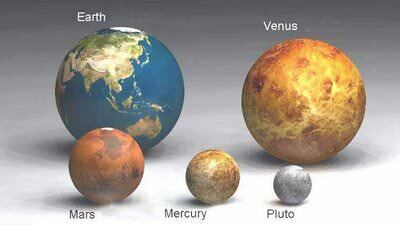 Mercury is not that much larger than the Moon, and it is actually smaller than some of our Solar System’s larger satellites, such as Titan. Despite Mercury’s small size, it is actually dense with higher gravity than you would expect for its size. Venus has a radius of 6,052 kilometers, which is only a few hundred kilometers smaller than Earth’s radius. Most planets have a radius that is different at the equator than it is at the poles because the planets spin so fast that they flatten out at the poles. Venus has the same diameter at the poles and at the equator though because it spins so slowly. Earth is the largest of the four inner planets with a radius of 6,378 kilometers at the equator. This is over two times larger than the radius of Mercury. The radius between the poles is 21.3 km less than the radius at the equator because the planet has flattened slightly since it only takes 24 hours to rotate. Mars is a surprisingly small planet with a radius of 3,396 kilometers at the equator and 3,376 kilometers at the poles. This means that Mars’ radius is only about half of Earth’s radius. Jupiter is the largest of all the planets. It has a radius of 71,492 kilometers at the equator and a radius of 66,854 kilometers at the poles. This is a difference of 4,638 kilometers, which is almost twice Mercury’s radius. Jupiter has a radius at the equator 11.2 times Earth’s equatorial radius. Saturn has an equatorial radius of 60,268 kilometers and a radius of 54,364 kilometers at the poles making it the second largest planet in our Solar System. The difference between its two radiuses is a little more than twice the radius of Mercury. Uranus has an equatorial radius of 25,559 kilometers and a radius of 24,973 kilometers at the poles. Although this is much smaller than Jupiter’s radius, it is around four times the size of Earth’s radius. Neptune’s equatorial radius of 24,764 kilometers makes it the smallest of the four outer planets. The planet has a radius of 24,341 kilometers at the poles. Neptune’s radius is almost four times the size of Earth’s radius, but it is only about a third of Jupiter’s radius. Universe Today has articles on the radius of Neptune and the size of the planets. Astronomy Cast has an episode on Venus and more on all the planets.